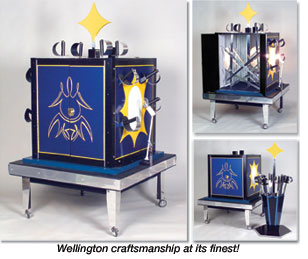 Walter Blaney came up with his unique version of the sword cabinet back in 1979 and Wellington Enterprises built it for him. Since then, Walter has added improvements and now Wellington is proud to add new features to its mechanical design. The Great Escape is Walter Blaney's unique improvement to the classic sword cabinet illusion. The finely decorated cabinet features translucent panels. Lights outside each of these panels allow the audience a clear view through the back and sides from inside the cabinet. This feature, combined with a unique base design brings the classic sword cabinet to a new level of deception. completely filling it, and must escape before 12 polished blades are thrust through the cabinet from all directions. When failure seems apparent, the magician opens the cabinet showing that the lady has indeed made good her escape. Lights from the outside are clearly seen flashing through the walls from the inside. There is simply no room to hide. Once the swords are removed, the lady reappears, having changed her dress during her absence. This illusion will fool audiences under all conditions. There are no angle problems and the illusion can be performed up close and surrounded. Great for trade shows - each sword makes a point and the illusion can be easily repeated. Here's an exciting illusion with flashing lights, a pretty lady, mystery, packs small and can be performed under the harshest conditions. Perhaps a better name would be The Magician's Dream! Inquire about custom ATA cases.